The chemistry of carbon compounds is called organic chemistry. Why organic chemistry? The simple answer is that the first carbon compounds studied came from living organisms and because of this, were known as organic compounds. Today, organic chemistry is a separate branch of chemistry, because more compounds are formed from carbon than from any other element. Approximately 90 per cent of all compounds are organic. The other main branch of chemistry is called inorganic - meaning non-organic chemistry. The diagram below shows where carbon compounds are found in nature. "The sun is the source that winds the clock of life." Until recently, it was thought that organic chemistry began when life began on this planet. Thus organic compounds were defined as those compounds obtained from plant and animal organisms, that is from living things. Furthermore, it was also believed that organic compounds could only be made in living tissue (in vivo) and not in test tubes in the laboratory (in vitro). This was called the vitalistic theory. As early as 1816 Chevreul, a French organic chemist, found that soap made from animal fat and alkali could be converted into other organic compounds. Twelve years later, Friedrich Wöhler, a German chemist, made the first organic compound from an inorganic compound when he made urea, a constituent of urine, from an ammonium compound. After this, many organic compounds such as acetic acid were prepared in the laboratory. By 1850 the vitalistic theory had disappeared from scientific circles. The next step was to make carbon compounds not known in nature. These too are classified as organic compounds. All the compounds in this diagram were originally formed from living things. Methane, CH4, was believed to be part of t he eart h' s original atmosphere, together with water, hydrogen and ammonia, and as such could be considered to be the first organic compound. In vivo, in life, from the Latin vivus, meaning living. is superior to synthetic vitamin C even though they are identical. A few carbon compounds such as carbon dioxide, metal carbonates and potassium cyanide are considered to be inorganic. This reaction in animals is called respiration and is the reverse process to that for photosynthesis. These reactions, photosynthesis and respiration, are summarised in what chemists call the carbon-oxygen cycle. What do organic compounds have in common? They usually contain hydrogen as well, and often oxygen and nitrogen, and less often sulfur, phosphorus and chlorine. They are all covalent compounds. They are generally insoluble in water. They do not conduct heat or electricity. Organic compounds are used for fuels. Complete combustion of a fuel gives carbon dioxide, steam and lots of energy. Incomplete combustion gives carbon (soot) and carbon monoxide (CO). These equations show an incomplete and a complete combustion of butane. You have seen these incomplete combustion products coming from the exhausts of inefficient car engines. Other products will form if other elements are present in the organic compound. Organic reactions tend to proceed slowly. Organic reactions require the breaking and then reforming of strong covalent bonds, and are usually slow. To speed up these slow organic reactions, heat and catalysts are used in the laboratory, while heat, catalysts and high pressure are used in industry. Extremely efficient biological catalysts, called enzymes, are used in living systems to bring about complex organic reactions at moderate temperatures. But why are there so many carbon compounds? Carbon as an element is fairly inert at room temperature; nevertheless it has the ability to combine with almost every other element in the periodic table. However, an enormous number of compounds is achieved with carbon combined with relatively few other elements. These other elements are hydrogen, oxygen, nitrogen, sulfur, phosphorus and chlorine. Tetravalent means to form four bonds. Carbon with its electron configuration of 2,4 is capable of sharing its outer shell electrons with four other atoms to form four new bonds. In doing this, it achieves the stability associated with an octet of electrons in its outermost shell. These four bonds are covalent. Carbon can form single, double or triple bonds. These are called valence bond structures. They show each covalent bond as a short straight line. This property is not unique to carbon because oxygen, for example, forms single and double bonds, and nitrogen can form single, double or triple bonds. 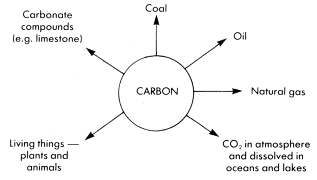 But carbon has one property no other element has to the same extent, and that is its ability to form carbon chains. Carbon can form covalent bonds with other carbon atoms to form chains of any length. To form compounds, at least one other element must be present. Hydrogen is the most common. Compounds containing carbon and hydrogen only are called hydrocarbons. The simplest hydrocarbon is methane, CH4 . This is methane. Remove one hydrogen and replace with a carbon. This carbon is tetravalent too. The remaining three links bond to hydrogen. This is ethane, C2H6. Remove one hydrogen and replace with a carbon. Add hydrogen as before. This is propane, C3H8. Remove one hydrogen and replace with a carbon atom. Can you draw elect ron dot structures for these compounds? Valence bond structures are also called graphic formulae. Chemists often refer to CH4 as the simples t of t he organic compounds. The ability of carbon to form long or short carbon chains is called catenation, from the Latin catena, meaning chain. To do carbon chemistry you must be able to count up to four. And swiftly as we see wines flow, yet sluggish olive oil will take its time undoubtedly because it is composed of atoms either longer or more hooked and mutually entangled. 1858, Couper asked Wurtz to present his ideas to the French Academy, but Wurtz failed to do so and t hus K ek ulé' s paper was published first. Kekulé subsequently received most of the credit. Couper was bitterly disappointed and he never returned to the serious study of chemistry. Kekulé became one of the most famous organic chemists of all. This process can be repeated to form chains of any length. What you are actually adding when you extend the chain by one carbon atom is not just carbon but CH2! The simplest hydrocarbon is methane. Natural gas is mainly methane. Hexane is a hydrocarbon with six carbon atoms. Your teacher will show you an example of hexane, C6H14. Your wash bottle is made from a king size hydrocarbon called polythene. The number of carbon atoms in a polythene molecule can be as high as 200 000! chains of carbon to be solids at room temperature and little light molecules to be gases. uld expect the chemistry of methane, ethane, propane and butane to be similar. Their chemistry is similar and all of these hydrocarbons belong to the same chemical family. Organic chemistry is organised to make the study of this subject as easy as possible. There are far too many compounds to allow individual studies of each, so a system must be used. The system chemists use is to put carbon compounds into families. These families of compounds are called 'homologous series'. Homologous means the same. Each family of compounds is given a name. 'Alkane' is the family name for a group of compounds of carbon and hydrogen. 1. Each member has similar chemical properties. (a) The melting points and boiling points increase with increasing chain length. (b) Solubility in a given solvent decreases. 3. Each member's formula differs from the one above and the one below by a CH2 group. 4. The mathematically minded of you may have realised that the formula of alkanes can be represented by a general formula. This is the final characteristic of a homologous series. Each homologous series can be characterised by a general formula. The general formula of the alkanes is CnH2n+2 and they are said to be 'saturated'. The terms have nothing to do with being saturated with water. They contain the maximum amount of hydrogen - unlike other hydrocarbon homologous series. They are 'saturated' with hydrogen. Chemists call the arrangement of atoms the structure. The structure of a molecule refers to the arrangement in space of its atoms. Whenever carbon is singly bonded to four other atoms, the carbon is at the centre of a tetrahedron. Methane, for example, is a tetrahedral molecule; so is carbon tetrachloride. Ethane can be seen as two linked tetrahedra. Can you visualise what happens in chains? A continuous carbon chain is referred to as a straight chain and, for convenience, it is usually drawn that way. However, using models, which have the correct tetrahedral bond angle (109.5°), it can be seen that strictly the chain is a zigzag one - or kinked or puckered because of the tetrahedral bond angle. Your teacher will show you this. But some of the carbon atoms can form branches on this chain. 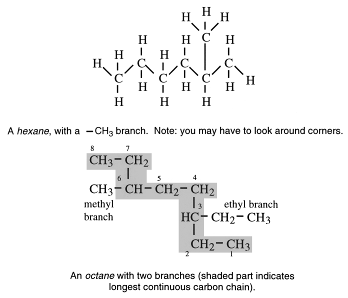 Here is an example of a branched chain alkane. and these are called condensed structural formulae. The arrangement of bonded carbon atoms is referred to as the carbon 'skeleton'; the hydrogens are thus like a 'skin'. Can you remember what an empirical formula is? In the middle of the 19th century there was great confusion among chemists about the ways of writing organic formulae - for example there were 19 different versions of the formula of acetic acid, which has only eight atoms! There is geometry as well as arithmetic to a molecule. Structural isomers are compounds with the same molecular formulae but different structural formulae. What, then is an isotope? Of the top 20 companies in the world today, seven are oil companies. An empirical formula is the simplest whole number ratio of atoms in a molecule. For methane, this is CH4. What is the empirical formula for ethane? The molecular formula of a compound is the actual number and kind of atoms present in a molecule. Methane's molecular and empirical formulae are the same. The molecular formula of ethane is C2H6. Structural formulae give some idea of the arrangement of the atoms in space, e.g. are all examples of structural formulae. They show which atoms are joined to which. Graphic formulae will be easier for you to write because they show at a glance that each carbon has four bonds around it. Carbon must have four bonds, no more and no less, because four electron pairs are shared to complete its outer electron configuration. Why use a structural formula instead of a molecular formula? The answer is that one molecular formula may apply to two different organic compounds - or to twenty or to over two million. A structural formula specifies which compound is being referred to. Remembering that carbon has four covalent bonds, oxygen two, and hydrogen one show the other way these atoms can be joined. Your teacher will help you here. The other compound is called dimethyl ether. • the fuel we seem to take for granted. The same organic compounds are used to provide both. • Natural gas - this is mainly methane, plus small amounts of ethane, propane and butane. • Coal - this has been an important fuel, and could become important again if petroleum sources dry up. The chemicals made from coal are mostly those we cannot get easily from other sources. 1854 when Professor Silliman of Yale University, USA was engaged to report on the properties of Pennsylvania rock oil as an illuminant and lubricant. In its first decade, petrol was a useless by-product of kerosene and was often run out into the rivers at night. Kerosene was known as "the new light". Kerosene lamps pushed back the night and extended the working day. The first foreign competition came from the Nobel family. Robert Nobel bought an oil refinery in Baku, an outpost of Russia, with brother Ludwig's money. Ludwig Nobel expanded the business and became known as 'The oil king of Baku.' Ludwig invented the first oil tankers - little more than floating bottles - and built a crucial 42 mile long pipeline ahead of competitors by blasting through a mountain with 400 tons of dynamite supplied by his even more famous brother Alfred Nobel. The emphasis on kerosene's importance diminished when the chief engineer working for Thomas Alva Edison's illuminating company in Detroit decided to branch out on his own to design and sell a petrol-powered car, named after him. This was the model T-Ford. At the beginning of the twenty first century oil still dominates security, prosperity and the nature of civilisation. It provides most of the energy and much of the chemicals used to run our society, which today is truly a "hydrocarbon society." Crude oil or petroleum is an important source of hydrocarbons. It is a complex mixture with chain lengths of the hydrocarbons present varying from one to nearly one hundred carbon atoms. 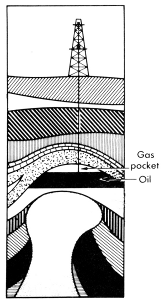 The actual components and their proportions vary from one oil field to another. Alkanes, with the general formula CnH2n+2 are the predominant hydrocarbons. The crude oil was formed millions of years ago from dead, sea animals and plant material, which accumulated on the sea floor, were covered by sediments and then subjected to heat from the interior of the earth, high pressure and bacterial action. Over a long period of time, crude oil formed and accumulated in the spaces between the sediment particles to become oil-bearing rock - hence the name petroleum, which means rock oil. We use petroleum products at a rate conservatively estimated to be about one million times faster than their rate of formation. "Oil - the essence of old sunshine." In the twent iet h century, oil, supplemented by natural gas, toppled old king coal from his throne as the power source for the industrial world. LPG stands for liquid petroleum gas. It is used as a camping gas and for portable gas supplies. A refinery separates crude oil by distillation into fractions, which are collections of hydrocarbons of different chain length. 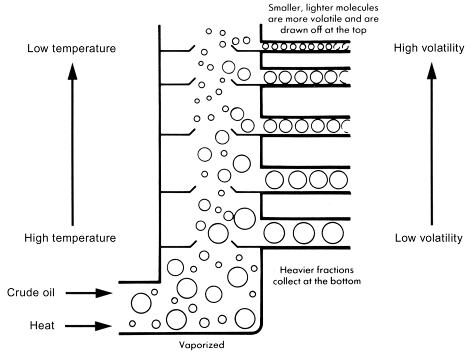 The process is called fractional distillation; a separation into parts or fractions. Refineries are complex operations, which are controlled by computers. South Australia's oil refinery was at Port Stanvac. All these fractions become progressively thicker, more viscous and more difficult to ignite. The quality of petrol is measured by its octane number. In an internal combustion engine, like that of the modern car, a mixture of air and vaporised hydrocarbons in the C4-C12 range (petrol) is drawn into the cylinder on the down stroke of the piston. This mixture is compressed by the piston on its upstroke and then ignited by a spark from the spark plug. A high-octane petrol will burn quickly and smoothly giving a surge of power and forcing the piston down into its next stroke. A low-octane petrol, on the other hand, will explode, setting up shock waves that batter the piston and cylinder walls, giving a knocking sound. This is called isooctane, or 2,2,4-trimethylpentane. You will learn how to handle these names with confidence later in this chapter. Isooctane has an octane rating of 100. There are no branches to this chain of carbon atoms. This petrol has been given an octane rating of zero. Other fuels are assigned octane numbers by comparison with these two - for example petrol with an octane number of 75 would show the same burning characteristics as a mixture of 75 per cent isooctane, 25 per cent heptane. One method of improving octane rating is to use tetraethyl lead, but this results in poisonous lead compounds being emitted from the exhaust. Cheap lead-free, high- octane fuel relies upon the addition of other hydrocarbons produced by refinery reactions. 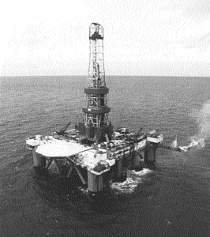 These methods were developed in the 1930s but not adopted by the petroleum industry as a whole until the 1970s. More oil is now needed for fuel than before. Physical separation is only one aspect of the function of an oil refinery. Another important role for the chemist is to change some of the less useful products into more useful ones. Fuels, especially petrol, are in great demand and less useful fractions are converted into this fuel. The distillation of crude oil does not provide enough petrol, and it has a poor octane rating. Chemical technology is used to solve this problem - to create products with the properties we want them to have. What sorts of alkanes are in crude oil? The answer is mostly straight-chain alkanes. The main problem for the chemist is that the branched-chained hydrocarbons are the better fuels. The more branched-chained molecules present, the better the petrol. The octane number of leaded petrol is about 97, and unleaded petrol 92. Knock increases engine wear and leads to wastage of petrol. This is why most petrols contain up to about 30% benzene! Crude petrol has an octane number of less than 60. In 1921, after a three-year search, Thomas Midgley discovered that the poisonous, oil-soluble compound tetraethyl lead, Pb(CH2CH3)4 was a cheap, anti-knock compound. As a result, he became a very wealthy man. -cyclic, in the range of pentanes to decanes. The quality of petrol is very much dependent on the hydrocarbons of which it is composed. In the C4 - C12 range, there are 661 possible alkanes. Therefore, there is no single formula for petrol. A catalytic cracker is an important installation in an oil refinery. The USA processes 12 x 106 barrels a year (a barrel is 284 L), and of this, one third is cat. cracked. Certain rocks called zeolites are now being used increasingly as catalysts. These rocks have a suitable uniform pore size and catalytic action is on the inside surface. These catalysts are more selective in producing molecules of the right chain length, and are faster, as there is less coke build up. compounds from less useful ones. Do you notice anything unusual about any of these formulae? 1. Small alkanes are stuck together to make bigger alkanes - but the percentage of lighter alkanes is small and, as these alkanes are also in demand, this reaction is not used very much in practice. 2. Cat. cracking - 'cat.' here stands for a catalyst. Cracking larger molecules into smaller ones of suitable size was first achieved using high temperatures alone, but with suitable catalysts (a type of clay containing Al2O3 and SiO2 is used) lower temperatures can be used. Coke is also formed which slows down catalytic action, so the coke must be periodically burnt away to restore catalytic activity. This provides a source of heat for the endothermic cracking reaction. 3. Isomerisation. Not only chain length is important but structure too. Isomerisation occurs when a molecule undergoes a chemical rearrangement to form a more branched isomer. 4. Catalytic reforming. A platinum catalyst is used and the process is sometimes called 'platforming'. This process converts straight-chain alkanes boiling in the petrol range into hydrocarbon rings without altering carbon number drastically, but the number of hydrogens will be reduced. This is a widely used refinery reaction as these hydrocarbons are used to replace tetraethyl lead, making unleaded fuel. The cracking of kerosene illustrates this conversion. There are three basic fractions that yield petroleum. Light naphtha and heavy naphtha give mainly straight-chain alkanes - called 'straight run' petrol, which can be converted by isomerisation into petrol with a higher octane number. Some light naphtha and heavy naphtha is 'catalytically reformed' into other hydrocarbons, such as benzene, methylbenzene (toluene) and dimethyl benzene. Crude oil also contains some of these compounds. These also have a high octane rating, and can be used to replace tetraethyl lead. Gas oil is cracked into petroleum sized molecules and these, in turn, may be subjected to isomerisation and catalytic reforming. These same three basic fractions provide six out of seven of the most important hydrocarbons in the chemical industry. Of these seven compounds, ethene, obtained by cracking, is the most important of all. There is a competition between these compounds needed for fuel and the same compounds needed in the chemical industry. Eighty eight out of every 100 barrels of oil are used to produce energy. The other 12 barrels are used for the manufacture of a wide variety of chemicals. The petrochemical industry has grown since World War II when, because of shortages of products such as silk and rubber, substitutes were developed. After the war the research effort was redirected towards consumer goods. The most important of these seven, the 'big three,' are in bold type. 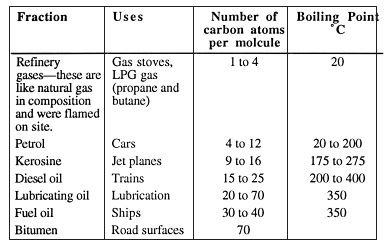 All of these are hydrocarbons, i.e. contain carbon and hydrogen only. Methane comes from natural gas but the remaining six are derived chemically from crude oil fractions. The point to note is that these few compounds can be converted into many, many others - thousands of sophisticated chemicals and plastics. Organic chemicals can be interconverted quite simply using a basic set of reactions. You must realise that although many compounds are possible, the basic reactions to produce them are few. Organic chemistry is not difficult! The simplest of the organic chemical families is a group of saturated hydrocarbons called the alkanes. All alkanes take part of their family name, the 'ane,' into their own name. Alkanes are hydrocarbons (that is they contain carbon and hydrogen only) and are said to be saturated hydrocarbons - meaning they contain only C _ C and C _ H single bonds. They contain the maximum number of hydrogen atoms per molecule. form oxides of sulfur so contributing to "acid rain". These oxides also poison the catalytic converters fitted to cars. When an oil spill occurs it is the BTX component that does the most damage to sea birds and mammals. The sticky, tar-like blobs are difficult to remove. Not only do we build from carbon chains, we also depend on them everyday of our lives. Foods are carbon chains, as are clothes, packaging, paper, fuels and plastics! 1 Which are gases, which liquids and which solids at room temperature? 2 What is the general formula of an alkane? The alkanes are all non-polar compounds. What observation in the laboratory tells you that alkanes do not react with the two extremely reactive metals, sodium and potassium? 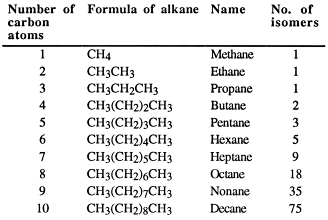 Here is a table of the first 22 alkanes - they are members of an homologous series and are all straight-chained. You can also get branches on each of these chains. What is to be appreciated is that, because of branching, the number of alkanes possible is very great. Your teacher will only expect you to know the names of the first ten alkanes. Alkanes are insoluble in water, and less dense than water. They form a layer, which floats on top. 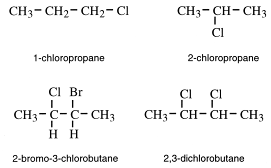 They dissolve in organic solvents, such as dichloromethane, CH2Cl2, and liquid alkanes are soluble in each other. Petrol is an example of alkanes soluble in each other. They have low melting points and boiling points. They are very unreactive. Their former family name, 'the paraffins', means 'little affinity'. 1. They do not react with concentrated acids, e.g. sulfuric acid. Two non-reacting layers form. Concentrated sulfuric acid does react with most other organic compounds. 2. They do not react with concentrated alkali, e.g. concentrated sodium hydroxide solution and concentrated potassium hydroxide solution. 3. They do not react with strong oxidants. Even on standing for some time, these strong oxidants show no colour change when added to any alkane. 4. They do not react with bromine in the cold and in the absence of light. This is shown by no loss of colour. They do react if heated or subjected to bright light. In sunlight the reaction occurs very slowly. This reaction can be used commercially to form carbon tetrachloride, an industrial solvent. In practice, a mixture of substituted hydrocarbons is formed and these must be separated by fractional distillation. For higher alkanes, a bigger variety of products is possible. From the above, it would be quite wrong to say alkanes are totally unreactive - or that they are unimportant. Commercially, they are the most important organic compounds because they occur naturally in large quantities and from them chemists make almost all other synthetic organic compounds. Their most important use is as fuels, e.g. Where does the energy produced come from? Because alkanes occur naturally (e.g. in natural gas), it is seldom necessary to make them in a laboratory. However, methane is prepared by bacterial decomposition of organic waste. This provides a renewable energy source. Other methods for making alkanes used in fuels are being investigated. Microorganisms present in the dung decompose it in the absence of air to form methane gas. At sewage works, methane generated from the sewage is used to generate the electricity to power the works. Methane is a colourless, odourless gas. A smelly impurity is added to gas used for domestic use so that gas leaks can be detected. Jean Baptiste Dumas, a 19th century Professor of Chemistry in Paris, discovered substitution when he was asked to analyse s om e candles whic h had distressed guests at the King's reception by giving off acrid fumes. The gas was HCl and he traced this to some chlorine, which had been used to bleach the candles. He found that chlorine had reacted chemically with the candle wax, replacing some of the hydrogens with chlorines. He found bromine and iodine could replace hydrogen as well. Dumas could not gain acceptance of his ideas although they were correct and he gave up his brilliant chemical career to become a politician. How many hydrogens can be displaced altogether in hexane? How many compounds can be formed by reacting hexane with chlorine? It is oil that makes possible where we live, how we live, how we commute to work, how we travel. Bacterial decomposition in the absence of air is called anaerobic. Gas was once made from coal at a gas works. Today we use natural gas, and no longer need to make gas. Alkenes are sometimes called olefins, meaning "oil-forming". The type of bond in the chain, here a double bond, controls the compound's chemical properties. Cracking is the only commercial source of ethylene (ethene) and propylene (propene). Ethene and propene are used extensively to make plastics. Al l al kenes are non-polar compounds. The next in our family of organic compounds is named the alkenes. The general formula of this homologous series, CnH2n, shows that the alkenes have more carbon and less hydrogen in their molecules than do the alkanes. Note again that the members of this series take part of the family name. A functional group is a reactive site in a molecule or any atom or group of atoms, which cause that molecule to take part in a chemical reaction. Like alkanes, they have low melting points and boiling points. The first members of the homologous series are gases; again similar to the alkanes. Alkenes are much more reactive than alkanes. This is because alkenes have a functional group. Addition and oxidation are the typical reactions. Alkenes burn with luminous smoky flames. The smokiness due to unburnt carbon is typical of unsaturated hydrocarbons. With the higher carbon to hydrogen ratio, some carbon remains unburnt. The colour of bromine rapidly disappears when bromine water is shaken with an alkene. This is used as a test for unsaturation. The two reactants form one product with a molecular formula, which is the sum of the two reactants' formulae, e.g. One bromine adds to one end, the other bromine to the other. One double bond forms two new single bonds and the product is saturated. 'polyunsaturated' into margarine, is accomplished with this reaction. Catalytic hydrogenation continues until the fat is of the right spreading consistency. An acid catalyst (usually concentrated H2SO4) is used. This is the commercial method of making ethanol. Methylated spirits, which is about 95 per cent ethanol, is the most common industrial solvent. X can be F, Cl, Br or I (as a concentrated solution or as a gas), e.g. Bromine, Br2, is a dark red-brown l i q u i d ; b ro mi n e w a te r i s p a l e yellow or orange, depending on concentration. Hydrogenation can occur at room temperat ure when t he nickel catalyst is added. A ddit ion r eac t ions ar e wher e atoms are added to the double bond in an alkene, or the triple bond in an alkyne. Hydrogenat ion react ions also occur in living cells. 'Ant ioxidant s' are added t o polyunsaturated vegetable oils & margarine to stop them becoming rancid. The acids formed on oxidation have nauseating odours. A polymer is a very large molecule made from simple units repeated many times. Rubber is a polyunsaturated hydrocarbon polymer, which occurs naturally and is also made artificially. It is rapidly oxidised by ozone, a pollutant in urban areas, such as Los Angeles. Car tyres, rubber hosing, gaskets and boots are attacked. Note that reaction only occurs at the functional group. The saturated part of the molecule, regardless of size or shape, can be ignored. Note also that these are addition reactions. Adding of atoms has occurred across the double bond. Alkenes decolourise acidified potassium permanganate. This is another test for unsaturation but it is not as good as the bromine water test. KMnO4/H+ is decolourised by other functional groups too. The reaction is an addition and an oxidation since oxygen adds to the alkene. On warming, the parent chain can be broken into smaller pieces due to reaction at the alkene group. Polythene is a giant alkane and the world's most common plastic. Other plastics are made from reactions similar to this. A third family of hydrocarbons is called the alkynes. The general formula, CnH2n-2, shows that they too are unsaturated hydrocarbons. The two carbons of the functional group and the two atoms directly attached to it are in a straight line. Ethyne (acetylene) itself is a linear molecule. It is used as a heat source for joining metals by melting them together. This is called oxy-acetylene welding. 2000°C. This makes it expensive to produce and so acetylene in turn becomes expensive. For this reason, most chemicals now being produced from ethyne (acetylene) will in future be prepared from ethene instead. The properties of all the members of the alkynes are very similar - acetylene is the example used here. Acetylene (ethyne) is a colourless gas, insoluble in water. Other members of this homologous series have progressively higher boiling and melting points. 1. Acetylene burns with a luminous and very smoky flame. Why is this so? and very high temperatures - approximately 3000°C - can be reached. This reaction is used in oxy-acetylene welding. Addition occurs first to both ends of the triple bond, then to both ends of the double bond. Can you name the two addition products? To prevent explosions, acetylene and chlorine are usually mixed in retorts with kieselguhr and iron filings to absorb the heat of the reaction. Addition compounds are then formed. At room temperature, in the presence of a nickel catalyst, acetylene adds hydrogen. The reaction takes place in two steps. 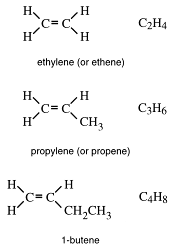 First ethene (ethylene) and then ethane are formed. The alkynes, like the alkanes and alkenes, are all non-polar molecules. The flame temperature of C2H2/air is 2325°C. The flame temperature of C2H2/O2 is 2975°C. The much hotter flame with oxygen is due to no nitrogen being present. N2(g) absorbs some of the heat released when acetylene burns in air. Kieselguhr is a soft fine-grained deposit consisting of the siliceous skeletal remains of diatoms, formed in lakes and ponds. Kieselguhr is used as an absorbent filtering material, filler, and insulator. Acetylene and the other members of the homologous series undergo both addition and oxidation reactions like the other family of unsaturated hydrocarbons, the alkenes. insecticide, far better known as dieldrin! Vinyl chloride is used to produce the plastic, polyvinyl chloride or PVC. Acetylene turns the purple alkaline potassium permanganate solution green. This is evidence that oxidation has occurred. Naming compounds in organic chemistry is referred to as nomenclature. Rules for naming have become necessary because there are so many compounds and their numbers are increasing. Systematic names give the structure of the compound being referred to. Previously only unsystematic names were used which could refer to the source of the compound, e.g. jasmone from jasmine, or to a property of the compound, for example putrescine has a foul smell. Unsystematic, 'trivial' or 'common names' abound. In fact, they are still probably used more than systematic names because of their brevity, and because when a new compound is first isolated, the structure, upon which its name is based, is frequently not known. Lengthy cumbersome names are rarely used in day-to-day conversation, even among chemists. They are reserved for scientific publications where it is essential to give an unambiguous statement. However, the basic rules of nomenclature for simple compounds are easy to apply, and having mastered these, you will know how to convert a name to a structure and a structure to a name. We start with the names of the alkanes because if you know the names of the first ten alkanes, you have a basis for naming hundreds of thousands of other compounds. Learn the names of the first ten alkanes and the number of carbon atoms associated with each name. 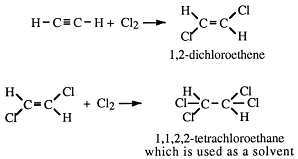 important side chains are _CH3 (methyl) and _CH2CH3 (ethyl). These do not exist separately but only attached to longer carbon chains. They have one hydrogen less than the alkanes from which they are derived. 1. The name of the 'parent' alkane chain. 3. The position numbers of the substituents on the parent chain. 1. Look for the longest continuous carbon chain. This is called the parent chain. e.g. 2. 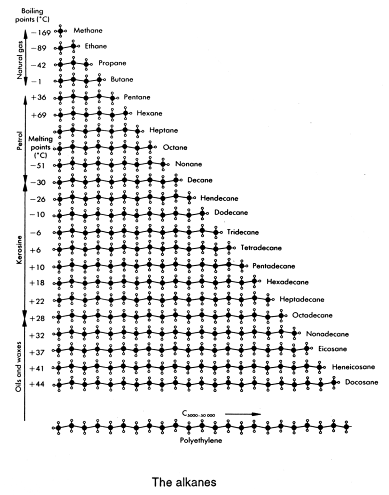 Number each carbon atom in sequence from the end closer to the branches. 3. Side chains are listed in alphabetical order. For example ethyl is written before methyl. learning about the structure of organic molecules. Borrow a model kit from your teacher. The rule is that the substituent must be given the lowest possible number. Hence this compound is not called 4-methylpentane. Commas separate numbers, and hyphens separate numbers and words. The final word, however long, is written as one word. Every hydrocarbon with an alkene group has an 'ene' ending to its systematic name. In longer alkenes and alkynes, the position number of the functional group is part of the name. A halogen can be attached to a parent chain by a single bond like a branch. Their names become _F (fluoro), _Cl (chloro), _Br (bromo) and _I (iodo). 1 Name the parent chain. 2 Name the substituents and put in alphabetical order. 3 Put in the position number of each substituent. According to text books there are three other isomers having the same molecular formula as the dimethylbutanes shown above. Draw graphic formulae for these compounds and name them. Look for the longest continuous chain containing the alkyne group. This is the parent chain. The 'ane' part of the parent alkane is changed to 'yne'. What is the systematic name for acetylene?